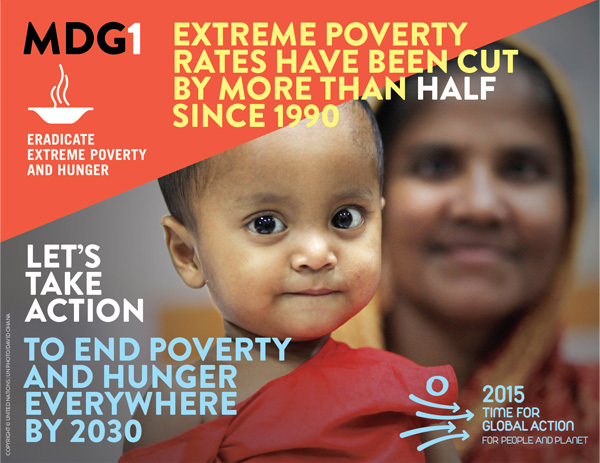 More than 1 billion people have been lifted out of extreme poverty since 1990. In 1990, nearly half of the population in the developing regions lived on less than $1.25 a day. This rate dropped to 14 per cent in 2015. At the global level more than 800 million people are still living in extreme poverty. Globally, 300 million workers lived below the $1.25 a day poverty line in 2015. The global employment-to-population ratio – the proportion of the working-age population that is employed – has fallen from 62 per cent in 1991 to 60 per cent in 2015, with an especially significant downturn during the global economic crisis of 2008/2009. Only four in ten young women and men aged 15-24 are employed in 2015, compared with five in ten in 1991. The proportion of undernourished people in the developing regions has fallen by almost half since 1990. Globally, about 795 million people are estimated to be undernourished. More than 90 million children under age five are still undernourished and underweight.